bunny☆kaisui's blog: MUSIC JAPAN May 30 show: IDOL Special!! MUSIC JAPAN May 30 show: IDOL Special!! This MUSIC JAPAN Idol Special was announced some weeks ago and it was recorded on May 17. It was a big surprise for all of us!! Is like a dream come true, don't you think? It's good to know idols are getting more and more popular those days. Specials like this one should be repeated. 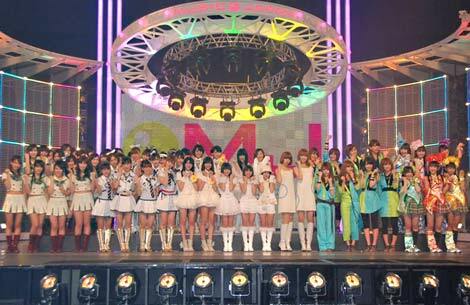 It's not the first time there's is some kind of collaboration within different idol groups this year. The new "show" GIRLS POP NEXT (which can only be seen or downloaded from the internet) includes YGA (Yoshimoto Gravure Agency), Momoiro Clover, SDN48 and many others. They did their first special live on February and they're planning a second one for June!! Music Japan is going to be broadcasted this Sunday! So be sure to see it with KeyHole TV or just wait for the video file to be uploaded!! The H!P front group with its 43rd single: Seishun Collection (青春コレクション "Youth Collection"). A slow but nice song with very colorful and stylish (?) outfits : D.
The now super popular idol group AKB48 presents its 16th maxi single called Ponytail to Shushu (ポニーテールとシュシュ "Ponytail and scrunchy"). A single that already sold more than 450000 copies in only 4 days, maybe for its 4 Songs+PVs deal or for those senbatsu tickets ;P. A sumerish song with cute uniform styled outfits may be the cause too :D. Idoling!! present their 12th single: Me ni wa Aoba, Yama Hototogisu, Hatsukoi (目には青葉 山ホトトギス 初恋, "Sight of Aoba, Mountain Cuckoo, First Love"). A happy song with cute uniform styled outfits ^^! I can't say much about them because I barely know this group =S. They present their mini-album Def&Def wich contains two versions of the song D&D and some covers from anime theme songs!! Momoiro Clover present their latest single Ikuze! Kaitō shōjo (行くぜっ！怪盗少女 "Let's Go! Phantom Thief Girl"). A "genki" song with really enegergic dance! Click here to read more about them~. The new avex idol unit! The young but talented girls of Tokyo Girl's Style present their two debut singles Kirari (キラリ☆, "Sparkling") and Onnaji Kimochi (おんなじキモチ, "Same Feeling") both fresh songs with some cool dance steps. I let you with the very (very) short preview!! I saw Vanilla Bean's video on youtube and they are from "Tokuma Japan", I think... They imitate 70's/80's idols, right? 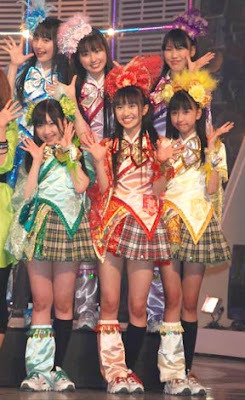 Momoiro Clover and Tokyo girl's style are AWESOME!!!! That seems an interesting show, can you tell us the exact channel and the broadcast time, please?